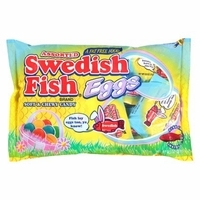 Swedish fish soft and chewy eggs and mini fish. These come in individual size treat packs making them perfect Easter basket candy. Each pack has an assortment of fruit flavored fish eggs along with the cherry flavored mini Swedish fish. It is sometimes hard coming up with candy for a teen Easter basket these would be perfect for candy for putting in your Easter basket for kids and adults. You get 18 .5 oz treat size packs per bag.